The confidence of power and security in the palm of your hand. TM When the power goes out, a lithium-ion battery powers the opener— including its LED light. A visible, easy-to-access, long-cycle life battery assures the dealer and the homeowner that the operator won't let you down when needed most. Call us for more information at 562-948-1816 or email info@adhguardian.com or visit www.adhguardianusa.com. 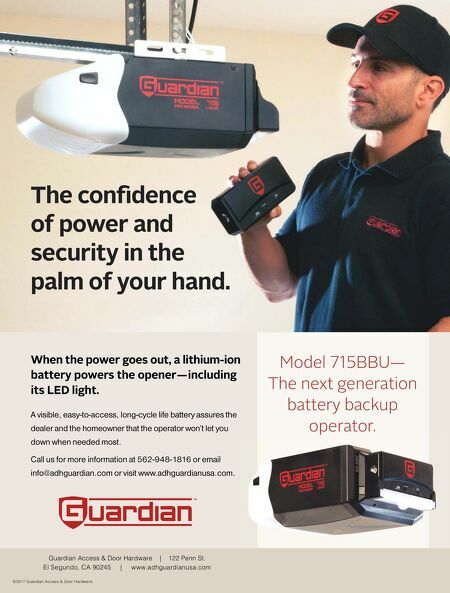 Model 715BBU— The next generation battery backup operator. Guardian Access & Door Hardware | 122 Penn St. El Segundo, CA 90245 | www.adhguardianusa.com ©2017 Guardian Access & Door Hardware.